Hawke 501/453 universal flameproof cable glands are suitable for steel wire armoured, steel wire braided and steel tape armoured cables - Hawke 501/453 cable glands are available in brass, nickel plated brass, 316 stainless steel and aluminium and are suitable for hazardous area Zones 1, 2, 21 and 22 installation. Hawke 501/453 universal cable glands are ATEX certified for Flameproof and Increased Safety applications. Hawke cable glands 501/453 incorporate innovative features that along with safety, enable fast installation, facilitate inspectability of the cable gland in operable condition and prevent corrosion of the cable wire armour or braid. Hawke 501/453 Universal cable glands provide outdoor or indoor cable terminations for single wire armoured ‘W’, wire braided ‘X’ and steel tape armoured ‘ Z’ elastomer and plastic insulated cables. For particular use with cables that exhibit ‘cold flow’ characteristics. Hawke 501/453 Universal cable glands provide armour clamping using one clamping arrangement for all armour/braid types - cable gland provides a diaphragm seal on the cables inner sheath which will not damage cable that has ‘cold flow’ characteristics. Provides an outer deluge seal to prevent moisture ingress to the cable armour/braid. Provides a cable retention and low smoke and fume, zero halogen seal onto the cables outer sheath. Hawke 501/453/Universal cable gland is manufactured as standard in Brass, Stainless Steel and Aluminium. NPT entries are nickel plated as standard. Full nickel plating by electroplating or electroless plating is also available. Hawke Rear Sealing System offers IP66, IP67, IP68 (30 metres for 7 days), NEMA 4X and Deluge (DTS01) Ingress Protection. The cable gland seal is manufactured from a silicone material with LSFZH (Low Smoke Fume, Zero Halogen) properties and is ozone and oil resistant. The Rear Sealing System covers the entire range of cable diameters without the need for special seals and the cable acceptance range is stamped on the backnut for ease of inspection. The gland backnut can be hand tightened with only one further spanner turn required to ensure IP66, IP67, IP68 and NEMA 4X. 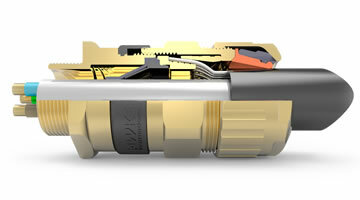 Hawke unique diaphragm sealing system does not damage cables which exhibit ‘Cold Flow’ characteristics. The Hawke diaphragm type seal is currently the only elastomeric seal to comply fully with IEC/EN 60079-14 and is therefore suitable on effectively filled ‘cold flow’ cables which would otherwise require barrier style cable glands. Hawke diaphragm seal is also unique in that it is the only flameproof elastomeric seal that can be visually inspected in operation – a real benefit to inspectors. Hawke RAC clamping system was invented by Hawke over 10 years ago and is a well established proven performer in all conditions. 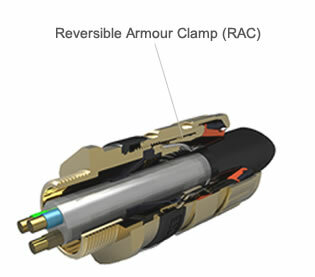 Simply by reversing the clamping ring the cable gland can adjust to accommodate all types of cable wire armour or wire braid. Hawke RAC flameproof cable gland clamping system is also fully inspectable when positioned on the cable. Pictured : Hawke Cable Glands - Hake 501/453 Universal Cable Glands are suitable for terminating both wire braid and armoured cables in hazardous areas. Simply by reversing the clamping ring, the Hawke cable gland can adjust to accommodate all types of cable armour or braid.